A cloud CRM tool, an online game, an e-health solution and an electronic detector… What could these projects have in common? These are some of the 10 winners of the first Wayra Week, which took place parallel to Campus Party Colombia last week. But what is Wayra? Wayra means “wind” in Quechua, and seems to be benefiting from a good one; it got off the ground in less than 6 months, surprising the skeptics. The idea came from José MaríaÁlvarez-Pallete, Telefónica Latin América’s CEO, at the beginning of 2011. He had noticed that the existing talent in Latin America too often had to leave their countries to develop their business ideas. This wasn’t good for Telefónica: for the group to grow, the local ecosystems have to grow as well. This is how he decided to pitch an accelerator to his fellow chairmen; it was approved very quickly and Wayra’s site was launched in April. Wayra will take place in 8 countries by the end of 2011: Colombia, Spain, Mexico, Argentina, Brazil, Peru, Venezuela and Chile. Telefónica’s target is to select ten ICT projects to accelerate in each country. Each project will receive between US$30,000 and US$70,000 and will be accelerated during six months (with a possible extension to one year if required by the project’s nature). But according to Gonzalo Martín-Villa, who is leading the project, Telefónica’s support goes much beyond financing. The teams will be working from Wayra’s offices: Wayra will have one physical location in each country, designed specifically for its needs with the ambition to become a reference. They will be able to network and receive advice from mentors. They will also get administrative and technological support from Telefónica, which will be sharing its know-how. If they need more capital during or at the end of the acceleration process, Wayra will also help the teams in their fundraising. Funds could even come from Telefónica itself: the group recently launched a seed capital fund for the region, Amerigo. Gonzalo Martín-Villa told me that he is often asked about Telefónica’s ulterior motives: people are often surprised that the group will only take a minority participation in Wayra’s projects, while investing money and resources in accelerating them (four people are working full-time for Wayra in Madrid, assisted by two to three staff in each country.) Moreover, Wayra will also accept ideas that might not directly benefit Telefónica: the group has a first look option and will make its distribution channels available, but if it chooses to pass on a project, this idea can be offered to another partner. Telefónica has been present in Latin America for a long time and needs talent to grow locally instead of moving to hubs such as Silicon Valley. The Argentine/Spanish serial entrepreneur Martin Varsavsky (listed in our post on The 25 Most Influential People Tweeting About Entrepreneurship) welcomed Wayra on his blog, calling it “a great initiative”. Following the calls to projects launched in Colombia, Spain and Mexico, Wayra received an impressive number of submissions in two months: almost 1,500, of which 480 came from Colombia. 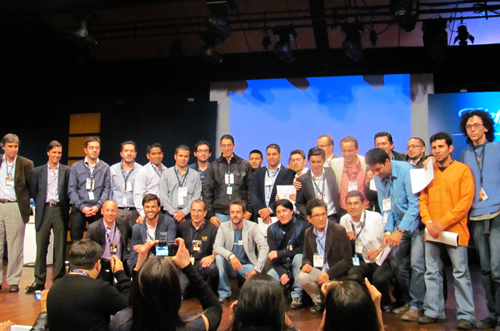 30 were shortlisted to participate in the first “Wayra Week” in Bogota last week. It took place in parallel to Campus Party Colombia, of which Telefónica is a sponsor (the next two Wayra Weeks will also happen in parallel to local Campus Parties.) Colombia is the first country to welcome Wayra, partly for a schedule reason, but also because Telefónica knew that the country had interesting talent base and plenty of innovation potential. Still, Gonzalo Martín-Villa confesses that Wayra’s team and jury were surprised by the number and quality of the projects they received. 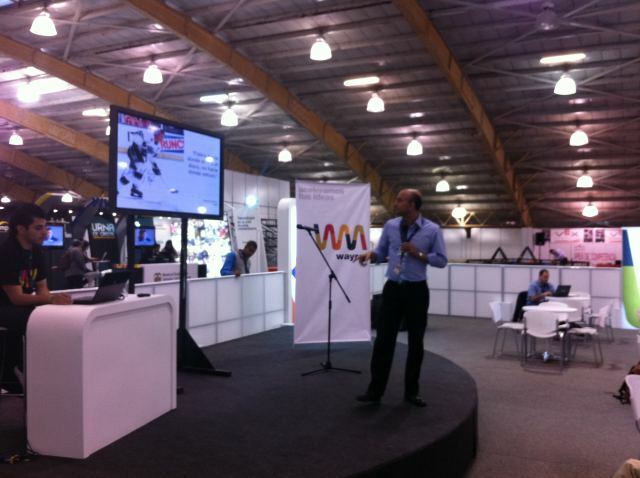 Wayra Week also exceeded the expectations of Alan Colmenares, who was a speaker at the event. Alan, who moved from Silicon Valley to Latin America 15 years ago, is a believer in the Colombian tech scene. About one year ago, he noticed that the country was falling behind other Latin American countries such as Brazil, and decided to do something about it. He has been trying to push Colombian digital entrepreneurs since then. Writing articles for technology blog VentureBeat and his own blog Tropical Gringo is part of his effort. Alan is also behind another high-impact initiative: thanks to his perseverance, Alan convinced Adeo Ressi to bring the Founder Institute to Colombia. The Founder Institute in Colombia focuses on quality rather than quantity: it started with 34 entrepreneurs and is now down to 8 startups. Alan hopes that high-quality companies will emerge from the initiative and thinks that Colombia is a good place to start in the region: it’s big enough to make money once a company gains traction, and small enough to test ideas and differentiate oneself. According to Alan, “Colombia needs a lot of initiatives”, which is why Wayra is very welcome, since its goal is to help the local ecosystems to grow. He’s hoping there will be interesting synergies between Wayra and Tayrona Ventures, the accelerator he’s about to launch in partnership with PagosOnline’s co-founders (PagosOnline was part of our selection of 10 Latin American Startups You Should Watch Out For.) Although startups with global ambitions are of interest too, this initiative will focus mostly on startups with regional expansion goals and aiming at filling gaps within the Latin America market. This could be an interesting option for some of the 20 projects selected for Wayra Week and who didn’t make it to the final shortlist. After three days during which the 30 selected teams received mentoring and polished their pitches, the jury (mostly external to Telefónica) picked 10 winners. Even if they’re all related to IT in some way, it’s interesting to note that they are in fact quite varied, from e-health (Glya) to CRM (Cubbi.co, NetHub Media Go2Do) to online gaming (Toomga) and music (Yimup). The teams will soon move to Wayra’s offices in Bogota and the incubation process will start. As for Wayra, it’s now gearing for the next series of Wayra Weeks which will take place very soon in Spain (Valencia) and Mexico – the selection schedule for the next countries should be announced soon. What do you think: will Wayra manage to create Silicon Valley’s across Latin America?